One of my favorite things about City University London is its prime location. Many times after my class, I find myself exploring a new area of London because of this. As a study abroad student, I love being able to access so many different and new places of my temporary home. One Saturday after I exhausted my brain in City’s library, I ventured to Borough Market, one of London’s oldest and biggest food markets. It did not disappoint! Saturday is likely the busiest day of the market. As I approached, I could see the streets surrounding the market teeming with people, an exciting sight for a people-person like me. Many of these people had street food in their hands, another exciting sight for a food-lover like me. When I slowly made my way into the market itself, I was soon experiencing the amazing market and all of the wonderful stalls. Some of the food vendors were quite typical for a food market; others were not. Some of the more typical stalls included fruits, vegetables, cheeses, and meats. But enjoyably, each of these ‘typical’ stalls had its own unique feel if even only a few feet away from each other. The unusual food stalls were also very unique in their own way. An exotic meat company caught my eye. It sold kangaroo and ostrich burgers, whole ostrich egg shells, and ostrich feather dusters, just to name a few. There were also a good amount of juice and smoothie stalls – likely to accommodate London’s up and coming juicing trend. Some of these smoothies included a wheat grass smoothie and a ‘hangover cure’ smoothie. Just a few minutes into my market adventure, I started noticing a good amount of people eating ice cream. Because I had already ate lunch, I made it my quest to find this (or any) ice cream stall. I continued to stroll through the market observing more unique stalls selling items like pasta takeaway, duck sandwiches, hot and spicy cider, fish, tea, olives (there was an all Greek-themed store), wine, spices, flowers, and plants. 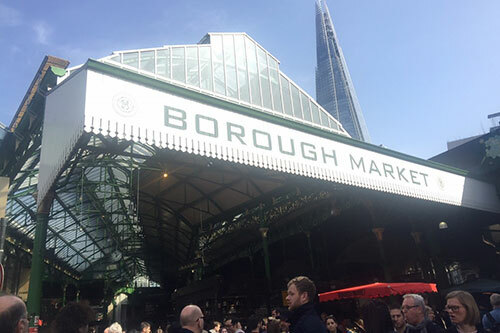 If you’re more of the souvenir type, there is a few stalls selling official Borough Market merchandise – tote bags, aprons, oven mitts, and more food-themed items. After passing by most of the stalls in the main hall, I crossed into Green Market, a more outdoor area of the market. I noticed lots of desserts here, almost as if the vendors knew this would be the last area people would explore. It was smart, though, because I finally found a stall selling ice cream, and I just had to try some. This vendor specialized in goat milk ice cream which was very interesting. I was looking forward to try something new and exciting – I chose almond flavour, and it was pretty good. 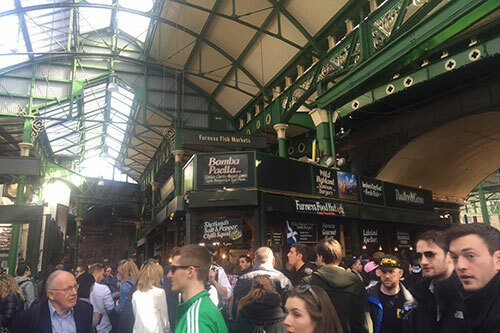 I really enjoyed that Borough Market was a place for both tourists and locals to enjoy. There is so much to see and do that I am already planning my next visit back to enjoy an actual lunch. If you’re looking for something to do that involves history, strolling, shopping, and food, Borough Market is the perfect place for you.